How Long Does a Hamster Usually Live? Hamsters make popular pets for many reasons. They're small and take up minimal space; they're affordable; and they require limited care when compared with the needs of dogs or cats. You can form quite a bond with a hamster, but unfortunately, hamsters don't live as long as other pets. Understanding the average hamster lifespan can help you to be aware of what's to come and appreciate every moment you do have with your pet. According to PetMD, domesticated hamsters usually live for between two and three years. Because of the short hamster life expectancy, they are considered elderly once they're just a year and a half old. Individual hamster life cycles are influenced by a number of factors. According to Squeaks & Nibbles, the genes that your hamster inherits from his parents can influence how long he will live. Environmental factors and your hamster's lifestyle also play a role in his lifespan. Lastly, chance is always a factor in your hamster's life. The good news is that there are a number of ways you can help to keep your hamster healthy, increasing the chance that he'll live a longer life. Squeaks & Nibbles states that the very food you feed your hamster could help him to live a longer life. Scientists found that particular diets resulted in hamsters living the longest. These diets included feeding hamsters either low levels of both fat and protein or high levels of both fat and protein early on in their lives. A diet containing 5 percent dietary fat and 15 percent protein may be best for your hamster. Fiber helps to regulate lipids in hamsters and lowers their risk of developing heart disease. Fruits, vegetables, and oats provide hamsters with fiber. Purchase the best-quality hamster food that you can afford to buy, but provide it in moderation. Offering too much food can cause your hamster to gain weight, which is also unhealthy for him. Your hamster's cage is designed to keep him safe, but if you buy the wrong accessories, you could actually risk your hamster's safety. 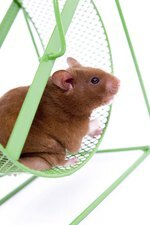 PetMD recommends that you purchase only hamster wheels with solid surfaces, since hamsters can break their legs in wire wheels. Your hamster will appreciate some chew toys, but make sure that these are safe for him. Soft wood blocks or other toys can help to distract your hamster from chewing on his wheel or on the cage. The bedding that you choose also plays an important role in your hamster's health. Wood shavings can cause issues like eye, skin, and respiratory irritation. Instead, opt for an unscented paper bedding. Proper and safe handling of your hamster can help to prevent some serious injuries or even death. PetMD explains that hamsters have very poor eyesight and can only see a few inches in front of them. Because of this, if you're holding a hamster or letting the hamster run around on a table, you have to be on guard to keep him from jumping or falling off the edge. It's safest to sit on the ground when handling a hamster. If children handle the hamster, be sure to teach them proper handling techniques so they can do so safely. Lastly, make sure that you don't inadvertently give your hamster a disease. According to PetMD, hamsters can catch colds from humans. Unfortunately, colds in hamsters can become much more serious bacterial respiratory infections. Make a habit of washing your hands even if you aren't sick in order to avoid transferring germs to your hamster.